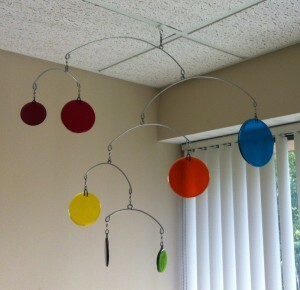 I have a beautiful mobile in my office and I refer to it almost every day when I am seeking to illustrate the ideas of change and balance. I mention balance quite a lot because, really, at the heart of what we do here in therapy, it is all about finding a new balance. Balance within ourselves, say in our relationship dynamics or eating habits or spending/soothing patterns. Sometimes its about adjusting (balancing) when those around us make changes, like in divorce or when the economy shifts. The overriding principle is that yes, initially all change feels bad. Even good, planned and sought-after change still feels uncomfortable, like in adjusting to a new job or, cough cough, dieting. But when we look to the mobile and follow its lead, what does the mobile do after it takes a blow? First: it shakes and reverberates for a while. But then if we give it enough time, it finds a new balance. Is it the same as before the blow? Nope. But is it any less beautiful than before the blow? I think not. It looks different and since we know that different doesn’t mean better or worse, then that’s OK. It’s still a mobile and it still holds the possibility of further future changes and even more unpredictable design, all the while seeking balance. I think that’s pretty cool. I love my mobile. This entry was posted in Divorce, Educational, Good Things, Inspiration and tagged adaptable, balance, change, different, guide, mobile, possibility, uncomfortable. Bookmark the permalink.